668 p., 17,2 x 25,0 cm. Edited and translated by Christoph Jungck and Lothar Mundt. ›Priscianus‹ und ›Iulius‹ are Frischlin’s two most well-known dramas. This is the first publication in a modern German translation. 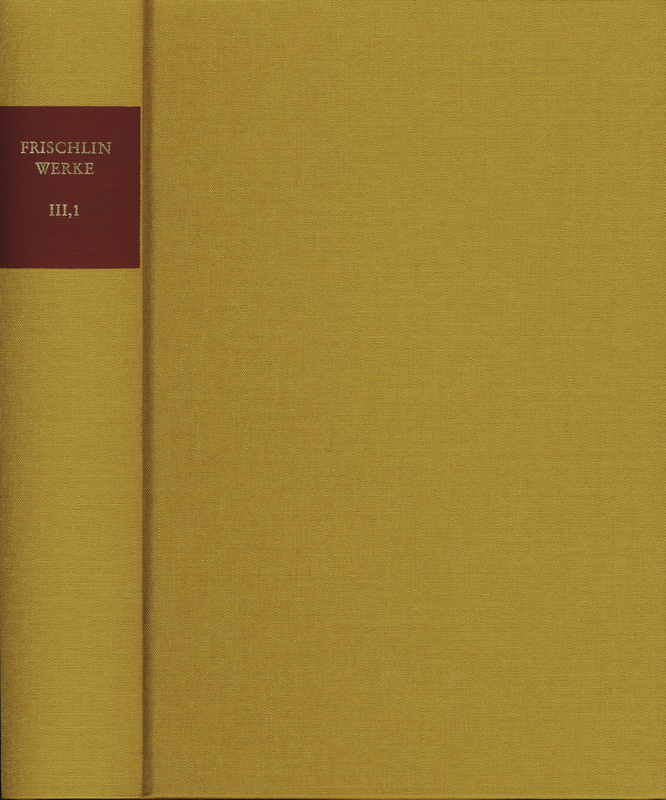 The appendixes contain the dedications, the prefaces and the afterwords from all of the editions published during Frischlin’s lifetime, also with a German translation. In his work »Priscianus« (first published in Strasbourg in 1580) Frischlin went back to the early years of humanism. In the course of the play Priscianus, the old Latin grammarian,the embodiment of classical Latinity, meets members of all four faculties who almost torture him to death with their technical jargon. In the end, Erasmus and Melanchthon appear as representatives of humanism and cure the mistreated old man of his sufferings by using drastic measures. Praise of the standard which had been reached in imitating ancient Latinity is also a main subject in ›Iulius‹ (first published in Strasbourg in 1580). Caesar and Cicero, risen from the underworld, admire the splendor of the large German cities, the art of war made possible by the German invention of gunpowder and the high level of literary education as well as the art of printing, also invented in Germany and useful as a magnificent medium for propagating these. Edition und Übersetzung werden, dessen kann man sich jetzt schon sicher sein, Frischlin neue Leser zuführen. Der Band III,1 publiziert die wohl populärsten Dramen Frischlins, die hier erstmals auch in einer modernen Übersetzung nachzulesen sind. […] Dem frommann-holzboog Verlag darf man zu zwei verdienstvollen Bänden gratulieren.